Students, faculty and staff gave their ideas and opinions at open town hall meeting. Last updated March 18th, 2018. Over the next five to seven years Mount Allison will undergo the extensive process of updating and renovating its library. The library revitalization project will include quality of life improvements like more power outlets, new lighting and asbestos removal, as well as large-scale changes to the library’s appearance and organization. The absolute earliest stage of this process involves collecting ideas and suggestions from Mt. A students, faculty and staff. Two town hall meetings were held to discuss how the library is currently used and how it might be used in the future. “Architects these days – we don’t come in as experts and say ‘This is what you should do,’ ” said Stephen Teeple of Teeple Architects, one of two architects present at the meeting. “We’re not here to tell anyone what to do. We’re going to talk about opportunities to make sure everybody realizes that there is a large scope of possibility for this project. The existing library has a lot of good things going on in it, and those can be made much more potent and powerful and beautiful, we think. We’re here to understand what people desire, what people want to see this library evolve into.” Stephen Outerbridge, an architect from EXP, was also present. The presenters also provided some examples of other recently renovated university libraries and learning centres, like the Ryerson Student Learning Centre and the Musashino Art University Museum and Library. Suggestions at the meeting on March 6 ranged from improvements for library staff workspaces to better natural lighting to the addition of a specifically Indigenous space developed in consultation with Indigenous students and faculty. Increasing accessibility in the library was a main concern for many. Lower shelves and more widely spaced stacks, accessible washrooms, and a more central, up-to-date, functional elevator were popular ideas. Sustainability going forward also came up. “I don’t know if you’re familiar with the Divest movement, but the idea among students and the community is that this has to be a green, sustainable building,” said librarian Jenny Scurlock, speaking from the audience. “And [sustainability] can’t just be a theme, it has to be a core principle.” She suggested the use of solar panels and geothermal energy for the library, and its detachment from fossil fuels. Other attendees brought up the idea of areas featuring different collections or archival materials that might be hidden from view otherwise. A number of people posed the idea of creating a space for art in the library. Both audience members and the presenting architects were interested in creating spaces for a variety of purposes and study habits. Teaching classrooms, peer tutoring space and offices for teaching assistants were put on the table. 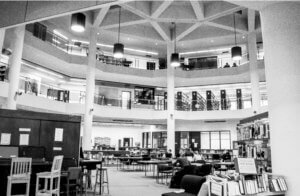 “From my perspective a big part of it is striking a balance between study space and social space, which I think the library we have now does reasonably well. I do like the flow of walking into the library and you have tables and people are chattering and whatever and you can find people you know and talk to them a little bit before you go about your daily business,” said one student in attendance. Overseeing the project is the Libraries 2025 Vision Committee. Co-chaired by Provost Jeff Ollerhead and VP international and student affairs Kim Meade, the committee includes one librarian, one library staff member and university librarian Marc Truitt, as well as five other members from various university constituencies. The committee is currently aiming to complete the library revitalization project by 2025, the 150th anniversary of Grace Annie Lockhart’s graduation from Mt. A. Beyond the recent town halls, Ollerhead said there would be more opportunities for the public to engage with the process in the future. He encouraged students and faculty to continue participating, and to encourage their friends and colleagues to do so as well. The next step of the process will involve attracting donors to fund the project, but this is tied into community interest and participation. “We need some idea that we can raise some money, but we need some really good ideas that we can raise money for,” said Ollerhead.